Medherant, a developer of innovative transdermal drug delivery treatments for pain and CNS diseases, has been awarded a Medicines Manufacturing Grant by Innovate UK. 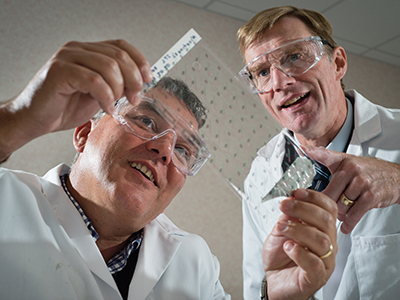 The grant will enable the Company to buy equipment and move forward with its plans to extend its pilot scale manufacture of patches formulated with its unique TEPI Patch® technology to GMP manufacture for clinical trials. The patent protected TEPI Patch technology enables the development of drug-in-adhesive patch products with better adhesion and more efficient delivery of drugs through the skin over a prolonged period. Medherant's first product, an Ibuprofen TEPI Patch, is in Phase I clinical development with initial results expected in Q4 2018. Medherant's business model is to develop novel best-in-class products to then out-license to established pharmaceutical companies for commercialisation. Medherant recently installed its own pilot-scale patch manufacturing plant and has successfully produced non-GMP patches of the Ibuprofen TEPI Patch. The Company has also produced TEPI Patches for third parties interested in assessing the suitability of the TEPI technology for their drugs. Medherant has a novel high-throughput permeation assessment process to rapidly identify formulations that meet the target drug release profile, enabling the creation of candidate patch formulations for companies in only 2-3 months. Medherant Ltd is a developer of innovative transdermal drug delivery treatments for pain and CNS diseases. The Company was founded by Professor David Haddleton and the University of Warwick in 2015. • TEPI Patch technology can be used with a wider range of drugs, including those that are not suitable for oral administration. • The amount of drug that can be loaded into the patch is greater, enabling the development of more effective transdermal therapies. • The TEPI Patch contains a novel adhesive which will provide a better patient experience as the patch sticks to the skin for longer, is less painful to remove, and does not leave a mark on the skin. Medherant is developing products containing proven drugs that it intends to license prior to commercialisation. The Company’s first product is an ibuprofen patch. Medherant also runs feasibility studies that give companies the opportunity to see the benefits of delivering their drugs using the TEPI Patch technology. Medherant seeks partnerships with companies wishing to extend the commercial life of their products or those that have drugs that cannot be delivered orally at sufficient dosage.